There's no reason 16th birthday wishes should be as hard to figure out as your typical teenager. Teens have a difficult enough time trying to feel good about themselves, so why make things harder for them (or yourself) with a lackluster birthday wish? 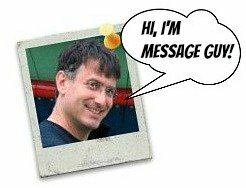 Essentially,you need to find 16th birthday messages with just enough inspiration, humor and understanding to make the birthday girl or boy feel important (not patronized). 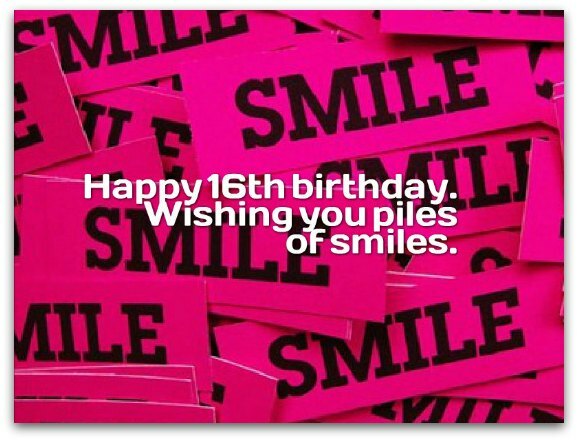 With the awesome birthday messages here, you'll know exactly what to write in a birthday card, eCard or text for your 16-year-old teen. 16 is not really a milestone birthday. For girls, in some cultures, it means celebrating what’s called a “sweet sixteen,” a 16th birthday party in their honor. For boys, there’s nothing (just the joy of getting one year closer to the 20s). At this age, when it comes to picking a birthday message, empathy is more important. As a rule, 16 year olds are less sensitive than your average 13 or 14 year old but they have not yet completely rid themselves of the typical adolescent demons: body image issues, sleep deprivation and, in turn, emotional outbursts. At the same time, 16-year-old teens are taking on new, more mature responsibilities, like driving and part-time work. In other words, you still need to watch what you say and do around them but they are a little more thick-skinned than a kid just entering the teens. Because birthday messages can be taken personally, you need to keep these 16-year-old teen issues in mind when you choose one. This is not that difficult — when it comes right down to it, you only have two options: the funny or serious route. Your choice ultimately depends on the personality of the birthday message's recipient. If the birthday boy or girl has a sense of humor, go the funny route but steer away from "body image" jokes. Everything else is fair game. If birthday boy or girl does not have a funny bone, you can pick a serious birthday greeting. Here, the field is wide open: you can be clever, inspirational, cool, sentimental, whatever you want. But don't be preachy — 16 year olds are too jaded for holier-than-thou messages. My wish for you is simple to say but not so easy to do: I hope you live a full life...full of joy and wonder, full of loving family and, finally, full of trustworthy friends. Happy 16th! Hoping your dreams take flight today, so you can soar through life’s storms and sunlight with joy in your heart and the wind beneath your wings. Happy 16th birthday! This is one of my favorite 16th birthday wishes on this page because it contains many of the milestones that are relevant to 16 year olds. I especially like the clever juxtaposition between the good-bye and hello elements. I think your 16 year old will like this birthday wish, too. Say goodbye to spin the bottle and say hello to dating. Say goodbye to secret notes and say hello to bull sessions. Say goodbye to the bus and say hello to your car! Wow, 16 sounds great. Happy 16th! ...develop unique personalities (and opinions), a bigger interest in friendships (and intimate relationships), a greater capacity to care and share, even a sense of independence and responsibility. This clearly tells you the type of subjects they want (need) to hear: character, friendships, love, caring, sharing, independence and responsibility (all with a positive, uplifting spin). May you go further than you have ever imagined, push the envelope and break new ground as only someone as incredible and one-of-a-kind as you can do! Happy 16th birthday! You've never been afraid of change. You don’t know fear. You are the bravest 16 year old I know. You make me so proud. Happy birthday! Turning 16 has its duties. You have a duty to be the sweetest you can be. Mostly, you have a duty to have a sweet time at your sweet sixteen. 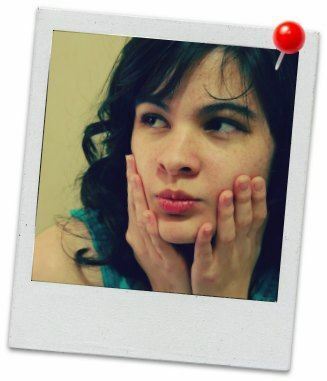 Happy sweet 16, sweetie! “Sweet” just begins to describe you. You’re an incredible daughter in more ways than one! We’re so blessed to be your parents. We love you! Happy sweet sixteen! Wishing you a life full of wonder, excitement, friendships and good luck. That's what we wish for you on this special day! Happy 16th birthday! I don't think there are many sweet 16-year-old girls like you. I'm even willing to wager that there aren't many as special or beautiful as you, darling. May your life be as sweet as your 16th birthday! On your special day, may you only be surrounded by an abundance of laughter, joy, cake, gifts, good wishes and loved ones! Happy 16th birthday! Even though you're on the cusp of growing up, experiencing what grown-ups experience, take the time to enjoy your 16th birthday and every day of this year. You’re only 16 once in your lifetime. 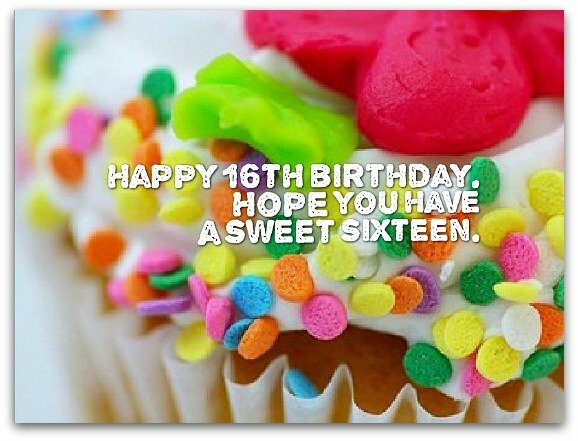 The 16th birthday wishes on this page are written to be sent by parents, grandparents, uncles, aunts, godparents...basically, adults. If you're a teenager yourself, these 16th birthday wishes are just a little too mature. Changing the 16th birthday wishes is a simple matter of changing the adult tone to more of a teen style. Say what? It's easy. Essentially, you take away any "pat-on-the-back, lovey-dovey" sentiment (as in I'm so proud of you and I love you) and add some BFF-to-BFF honesty and humor (if you want). Wow, you're fearless. Your courage makes me want to take a leap and do something really sick. You're sick. Happy birthday! I can't wait for your birthday. It's going to be a blast! Let's make it epic! Anything for a great friend. You're the best! Happy 16th! Wishing you a birthday full of amazing gifts, amazing boys, amazing birthday wishes and amazing fun. Happy 16th birthday! I don’t think there are many people I can call my BFF. I can call you my BBFF. May your 16th birthday be as great as you are! At 16, so many incredible things are in store for us. Real stores (with lots of stuff we love to buy) and the other things in store for us (like boyfriends). It's if we're excited about it, right? well, let's enjoy every second of this year! Happy 16th birthday! This is your special day. If it’s anywhere as incredible as you, it will be freakin' extraordinary. Happy 16th birthday! Wishing you a 16th birthday that’s more amazing than the birthday cake I hope we get to have and eat at your party. You're what a BFF is supposed to be — someone you can trust, someone who inspires you to be a better person, someone who's super fun, someone like you. Happy 16th birthday! Happy 16th birthday. Everyone tells us that 16 is when we’re just starting to feel comfortable in our own skin, even if our skin does not look so good. But I think it's getting easier and a lot more fun to be us. Today’s your birthday. If you don’t celebrate with wall-to-wall music, loads of laughter and tons of cake, you can forget about me. No, just kidding. I wouldn't miss your special day for anything. Happy 16th!